Broadband is essential to a thriving community – but it is not a panacea and it won’t work in a vacuum. The featured communities have broadband but they are successful because they also have a strategy for using it. All of the featured counties have received funding from the Blandin Foundation. 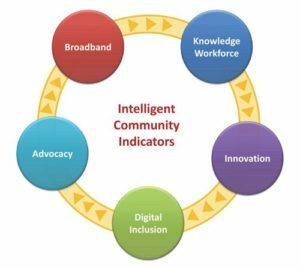 Through that affiliation they are familiar with Blandin’s rural adaptation of the Intelligent Community Forum model – the Minnesota Intelligent Rural Communities (MIRC) model, a holistic, broadband-based economic development strategy that embraces five community indicators of success: broadband, marketing and advocacy, knowledge workers, innovation and digital inclusion. Broadband Broadband allows for digital activity that promotes economic and community vitality. Marketing and Advocacy Promoting local technology helps with recruitment and encourages residents value technology. Knowledge Workers Training and supporting knowledge workers lead to better paying jobs and workers who are prepared for the future. Innovation Supporting innovation creates entrepreneurs in all sectors that lead the community into the future. Digital Inclusion Ensuring that everyone has access to technology and skills to use it means no one is left behind. The ultimate goal is to have a strong balance in each strategic area (and most communities have deployed activities addressing each indicator) but part of the process is recognizing at the onset where your community is strong, deciding where your community needs to be strong and working to make that happen. These counties have gone through that process – as mentioned four have gone through the process specifically with the Blandin Foundation. Beltrami County went through similar process with Bemidji Leads or at least a process that led to similar results. Below are tables for each county that highlight some of the strongest activities under each indicator they focused on. Marketing and Advocacy Paul Bunyan Communications brands the GigaZone, as a desirable location with Gig access. Innovation Creates the LaunchPad, a co-working location for entrepreneurs. Digital Inclusion Offers training on social media and other technologies to businesses at the LaunchPad. Broadband Uses funding levied for the schools to create a partnership with CTC to build better broadband. Knowledge Workers Brainerd Lakes Area Economic Development Corporation creates a Tech Recruiter program to connect skilled workers with technology companies. There is a concerted effort to build technical skills involving the business community and the schools. Marketing and Advocacy Creates Red Wing Ignite, an economic development organization to promote Gig access in their community. Knowledge Workers Promotes STEAM in the schools. Innovation Red Wing Ignite develops a Red Wing Ignite Cup contest to reward and lift up local innovation. Red Wing Ignite hosts the first rural hackfest. Digital Inclusion Develops an intergenerational tech class where high school students teach senior. Creates a telepresence center in the schools. Streams community radio, creating more reason for residents to get online. Marketing and Advocacy Residents formed a Cooperative to bring broadband to their area when local governments stepped back from the effort. Innovation Winthrop creates a mobile app to promote the city. Digital Inclusion Recruits a medical school to their area, creating opportunities for knowledge workers. Beltrami County is interested in supporting and growing a community of local businesses as well as recruiting tech businesses to the area. Crow Wing County is interested in bolstering technology skills in the area (through training and recruitment) to create a strong technology sector. Goodhue County is interested in promoting local innovation and entrepreneurialism that uses the Gig network to best advantage. Lake County is interested is allowing local residents and businesses to stay connected with the rest of the world. Sibley County is interested in serving using broadband as an economic tools – for local farmers and other businesses.